This playful design inspires your child to believe in magical possibilities from an early age. Mermaids, minotaurs, and fairies are tremendous, but nothing quite enchants playtime like a unicorn. With this playful design, your little one will learn to let their imagination soar. Featuring a golden horn, pink and white mane, and gentle expression, it adds just the right mythical touch to their play things. Made from 100% cotton with polyester stuffing. Designed in the UK. Made in Vietnam. I liked the subtle colors of this rattle. Also the rattle itself is gentle and not alarming..perfect for an infant. This was an additional gift to their shower gift (Tortilla baby blanket and crunchy taco booties)... 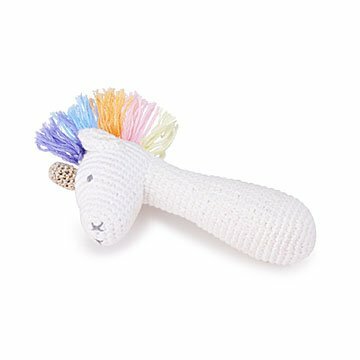 I plan on giving this adorable rattle to her once she's born.